Every time we (the team at Charter North) leave for the Kimberley, we are looking forward to seeing the Boab trees. Nowhere else in Australia can this tree be found, and its sometimes grotesque looks really are intriguing. The appearance of the Boab trees is unique, and every tree looks different. Some are large, some are skinny, some are smooth and some have wrinkles, just like humans really. 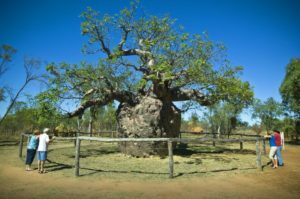 It is not surprising that the Boab trees are an integral part of every Kimberley tour, and probably the most photographed feature of the destination. The Kimberley Boab trees really are fascinating, and with all this information in mind, now all you have to do is come to the Kimberley and see them for yourself. And, of course, take your perfect Boab picture!